Things I like to grow, cook and eat. No Love Sincerer's Microwave Blog Challenge! A few weeks ago a friend of mine, Tom, got in touch to ask for my help. He currently has a microwave and only a microwave in his kitchen, but he wants to eat more healthily and wondered if I'd be able to come up with some simple, but healthy recipes for him that he could cook in his microwave, bearing in mind that he is not a very experienced cook. Now, I have to admit that the microwave is one piece of kitchen gadgetry that I don't actually use very often. I only ever use it for the occasional bit of defrosting and to reheat things (and even then I sometimes manage to cause my baked beans to melt into oblivion). The microwave I have is small and old with no digital display, and a sharp mechanical ping to indicate that food is ready (you can see it in the challenge 'badge' below!). I have never felt the need to replace it because it still works and I use it so infrequently. I did not want to turn down Tom's challenge, but at the same time know that I am not the world's best cook and felt a bit daunted by my lack of microwave know-how. And then I thought of all my lovely food blogger friends who I thought might enjoy this challenge, and also thought that this sort of thing might be of benefit to others as well. I will be joining in too, but I thought it might be a nice idea to get a range of different cooks to see what they could come up with. Anyway, enough with the pre-amble and on with the rules! 1) The recipes need to be simple, economical, and healthy, and use only a microwave. 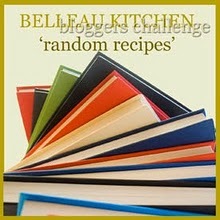 2) You can choose to create your own recipe or cook/adapt a recipe which already exists. 3) If cooking an already existing recipe, please link to it online or provide a link to the book you got it from. Please don't copy existing recipes onto your blog unless you have made changes - I wouldn't want anyone to get into trouble for copyright infringement! 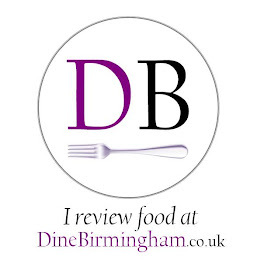 4) Post the recipe (if creating/adapting) or your experience of cooking the recipe along with a link (if using an existing recipe) to your blog and email the link to me at covfoodie(at)gmail(dot)com by 28th February. (If you don't have a blog and want to join in, please feel free to email your post to me and I could post it up on my blog for you.) If you are on Twitter please tweet about your blog post using the hashtag #microwavechallenge and I will re-tweet you! 5) Please feel free to use the badge above on your post. Or not, it's cool. Although a link back to this post somewhere would be groovy. 6) Once we have reached the deadline (that's 28th February), I will post a round up of all the blogs received. Tom will have a go at cooking some of the recipes and will post about them on his blog (I will link to them). I think that's everything. If you think I have omitted anything, or have any questions, please feel free to ask in the comments. Aqua Food and Mood is a Lebanese Restaurant situated on The Butts, Coventry (they've been there since May 2012 - before that they were on Gosford Street). I have known of this restaurant's existence for quite a while, but never got round to visiting before. We finally visited last Wednesday. It was quiet in the restaurant when we arrived at 6.30pm, but it soon filled up. The decor in the restaurant is elegant, and the atmosphere was warm and friendly. Abz (the owner) and the rest of the staff gave us a very warm welcome and Abz talked to us a little about Lebanese food and his restaurant background. We ordered some Lebanese wine (about £16), which complemented the spices in the food very nicely. As neither my husband or I had tried Lebanese food before, we decided to start with the Mezze Starter for two. This was a giant platter of various small starters. It sounds expensive at £9.99 a head, but for the sheer amount of food and the quality of the food, it was well worth it. It was also great to try a good mixture of Lebanese food. The houmous was amazing - so smooth and soft and flavourful. It has ruined shop-bought houmous for me now! I've never liked falafel when I've tried it in the past, but this falafel was light and crispy and delicately spiced. I loved the flavours of the taboulleh and the sujuk (sausage) too. To be honest, I liked absolutely everything on the plate, but those were perhaps the highlights. 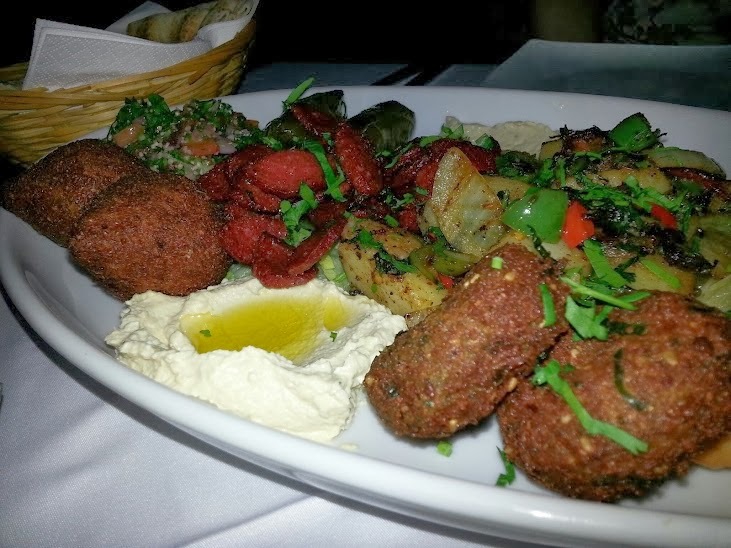 This was a great introduction to Lebanese food! 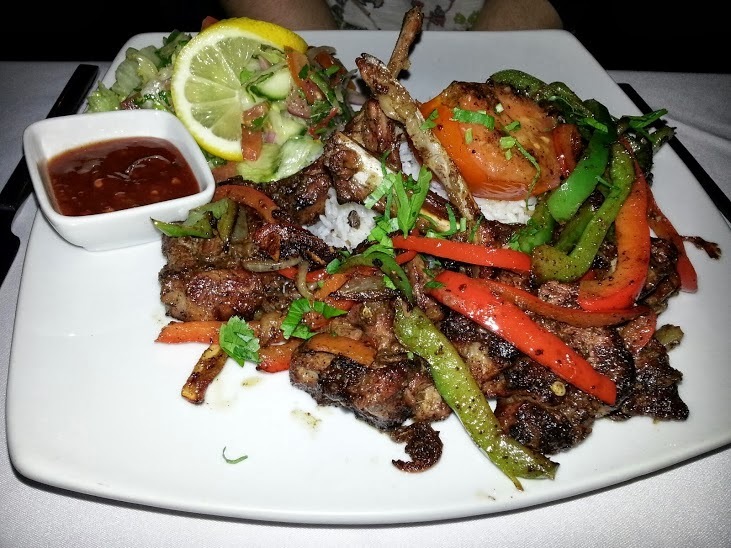 For our mains, my husband had the Mashwi Imshakal, which included lamb, chicken and kafta kebab (not bad for £12.90), and I had the Kastaletta (£11.95) - lamb cutlets with a spicy sauce. All the mains were served with rice and salad. The lamb cutlets were very tender and beautifully caramelised and I loved the spices they were coated in. The spicy sauce was very spicy but also had a very nice tang to it. I couldn't manage dessert after such a large starter and fairly hefty main, but we did have an Arak each as an aperitif. Arak is an anis-flavoured spirit made from grapes. We found it quite refreshing after the spicy food, although I would describe the flavour as interesting rather than something you can gulp down. Overall, then, we had a great time at Aqua. The food was delicious and very good quality. We very much enjoyed our first taste of Lebanese food. We plan to return with family and friends, and hope to try a dessert next time! Hello all! It's random recipes time again, and this month's challenge was to randomly pick a cookbook we got for Christmas and then randomly choose a recipe from said book. My job was made slightly easier this time by the fact that I only got one cookbook for Christmas this year, which was a Marks & Spencer book called The Vegetable Bible. I randomly opened the book on page 126, which gave me a recipe for Traditional Tuscan Bean & Cabbage Soup. This is a soup made from carrots, celery, cannellini beans, and cavolo nero - a nice winter-warmer type of soup. 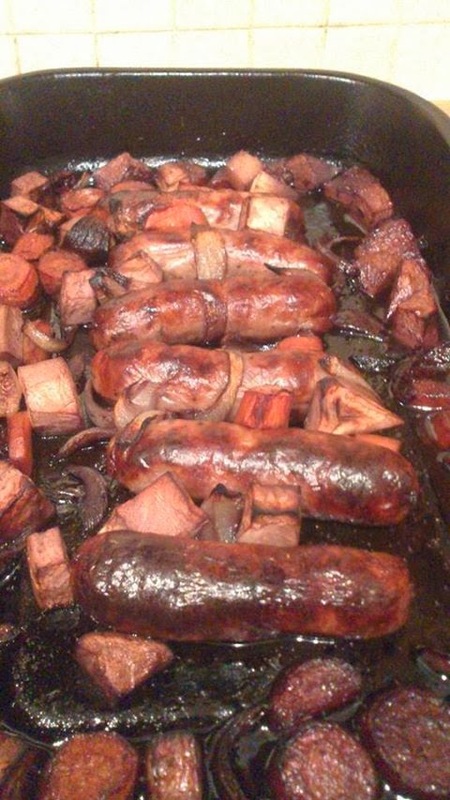 I changed a few things in the recipe to suit my own tastes and partly according to what I had in the fridge/cupboards. As I had some bacon in the fridge, and because bacon makes everything better, I decided to add some chopped bacon at the beginning and used its fat to fry the rest of the vegetables. I used tinned cannellini beans rather than dried, because I don't have a problem with using tinned beans and they take a lot less preparation... I also didn't blend half the beans as the recipe suggests - I just chucked them all in the pot. And instead of stirring in some 2-day old ciabatta loaf, I heated some ciabatta in the oven, sliced it and served it on the side. It made a lovely accompaniment. Overall, this was a very tasty soup (enhanced by bacon), that made a filling meal along with the ciabatta. I have made similar soups before, and find they are a good way to pack a lot of veg into one meal! I though it would also fit nicely with my easy after-work dinners series. 1. Heat the oil in a large pan, then add the onion, carrot and celery. Cook gently in the oil for about 5 minutes, until the vegetables have begun to soften. Add the potato, and continue to cook for 5 more minutes, or until the potato begins to soften. 2. Add the garlic and spices and, stir well and cook for a few more minutes, continuing to stir. 3. Add the lentils and stir well. Then pour in the stock. 4. Bring to a simmer and cover. Simmer for 20 – 25 minutes until the lentils and potatoes are cooked through and the liquid has reduced. Keep stirring occasionally to make sure the lentils don’t catch on the bottom of the pan. Add water if it begins to dry out. 5. Uncover, and add the spinach or kale. Cook for another 5 minutes, stirring occasionally, until the leaves have wilted. Serve with rice and/or flatbreads. I love celeriac. I love its beautiful, creamy, fragrant flesh. I think it's a very under-rated vegetable. Perhaps, like Kale, it might start to undergo a small revival at some point soon. I think more and more people are starting to discover the range of British-grown vegetables that are actually available, even over the winter months. I hope so, anyway. How can you not love a vegetable that looks like a brain? Whenever I get a celeriac in my veg box, I tend to make a soup. This Nigel Slater recipe that I wrote about a while ago is a fabulous recipe, and this one from the BBC is great too if you want more of the flavour of the celeriac to come through. But I didn't fancy celeriac soup this week, and I wanted to try and do something different with the celeriac I got in my veg box this time. I actually ended up using my celeriac in a couple of different dishes. Firstly, I used it in this braised venison dish. The recipe itself doesn't call for celeriac, but I had a feeling that celeriac would go well with the strong flavours of venison. I was right. I used it in place of the turnips/swede and I also used leeks instead of celery. It was a very tasty meal and I made enough for 4 people, so it lasted us two evenings. That was half my celeriac gone, so with the over half, I decided to add it to this Tipsy Sausage Tray Bake dish from Abel & Cole, along with carrots and onions. Yummy! 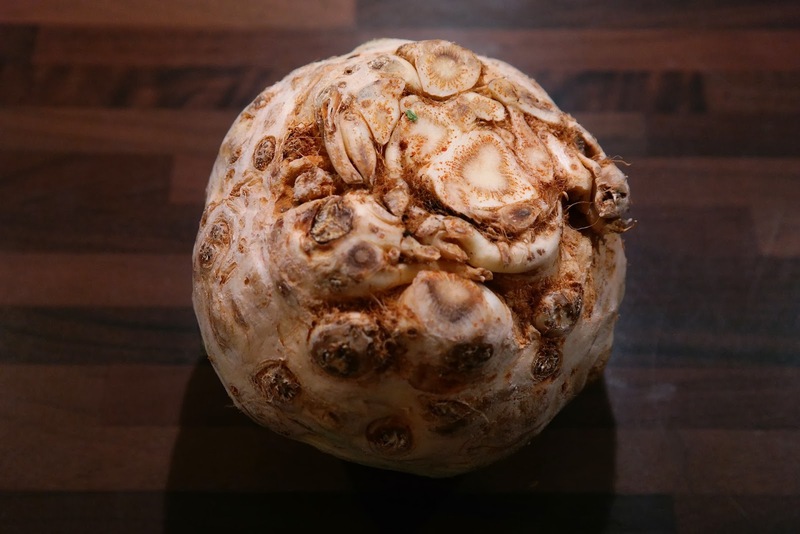 Does anyone have any other ideas for uses for celeriac? How can we make the most of this fabulous vegetable? Recipes, restaurants, travel... anything to do with food and drink! The growing season's not over yet! Chapter 6: Puddings - Completed!